The Mil Mi-14 is built in antisubmarine, mine countermeasures, and search and rescue versions. Its features include two Klimov TV3-117MT turboshaft engines, a boat-like hull similar to the Sea King, rear fuselage sponsons, and a retractable wheeled undercarriage. 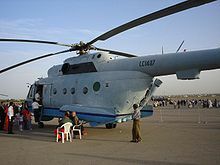 In all probability, the naval Mi-14 can be used for over-the-horizon target designation, guidance of surface-to-surface missiles and for search and rescue. It may have a bomb bay for antisubmarine torpedoes, depth charges and other weapons used against naval units. It was first flown in September 1969 and entered service in 1975 with the Soviet Air Force. 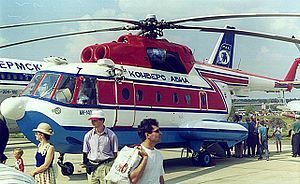 Prototype of the Mi-14 helicopter. Anti-submarine warfare helicopter, equipped with towed APM-60 MAD, OKA-2 sonobuoys and a retractable Type 12-M search radar, armed with a single AT-1 or APR-2 torpedo, one Skat nuclear depth bomb, eight depth charges. Armed version of the Mi-14PL, equipped to carry and fire AS-7 Kerry air-to-surface missiles. Polish designation of the Mi-14PL. Also known as the Mi-14PW. Search and rescue version with search lights and sliding doors with hoist. Search and rescue training helicopter for the Polish navy. One Polish Mi-17PL helicopter was converted into the Mi-17PX, after it had all its ASW equipment removed. Mi-14BT helicopters converted into fire fighting aircraft.